Sunday 1 October. Ormos Bay Circuit. Today was another rest day or non moving on day staying at Andros town. Ernie and Nicola had an easy day riding close to town. Peter rode with us to elevenses and then went back. Phil and Mary, Richard and I rode a very mountainous circuit via Ormos Bay on the east coast. Weather was warm and sunny all day with temperatures up to 24C but with a gale force NE wind. We rode west out of town up the valley to the west coast. When we stopped for a short break we met what I thought was a local at first but turned out to be a chap from Somerset who had moved here 10 years ago. We continued to the junction 900ft above the west coast of the Island and took refuge from the wind in a slate built bus shelter for a picnic elevenses. Then onward and upward to a high point of 1250ft with the road following the mountainside with great views down to the coast. The road then turned inland and twisted and turned among remote mountain villages for a 6 mile descent to Ormos Bay on the East Coast. We stopped for a picnic lunch, swim and sunbathe. Then a great long climb to the north with gradients reaching 13%. As we climbed with multiple switchbacks Ormos Bay became smaller and smaller below us. The top was reached at 1536ft. The climb was followed by a great 7 mile descent. We swooped down the ravine of the Vouni valley with every turn opening up more amazing views of mountains and seascapes and some great views of Andros Town. 32 miles for the day with 3340ft of climbing. Sunday 1 October. View of Andros Town. Today was a nominal rest day with no moving on but everyone went along with the idea of climbing over ridges to the north of Andros Town involving 3000ft of climbing. Weather was warm and sunny on the coast up to 25C but with clouds hanging over the high ridges clearing by afternoon. From town the first ridge at about 500ft was visible with the 2nd ridge at 1700ft towering above it. The 3rd ridge at 2300ft was hidden behind the second. We climbed the first ridge with scenic views behind of the town and bay.Then on to the head of the valley and the town of Apikia with little descending before starting the climb of the second ridge. We stopped in Apikia for a picnic elevenses in the absence of a Taverna. Then a steep climb to the top of the 2nd Ridge with dramatic views towards the coast and inland a strong wind was blowing low cloud over the ridge. The clouds were clearing as we started our fast descent back down made easier by the almost total absence of traffic. We stopped in Apikia to fill our water bottles from a natural Spring. The water is bottled in the village and sold as Mountain Spring water. On the way back Phil, Mary, Richard and I diverted to the beach and Cove at Stenies for a swim and some sunbathing. Saturday 30 September. Richard descending the 2nd Ridge. 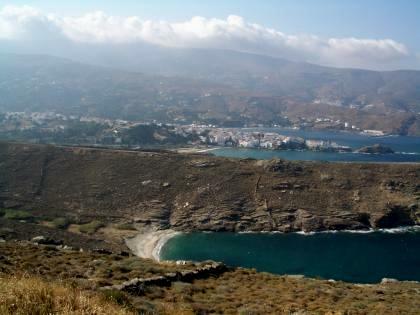 Today we moved on south along the coast and then along a valley to Andros town on the East Coast where we stay 3 nights. Weather was generally warm and sunny up to 25C with some clouds hanging around the mountains in the centre of the Island. We climbed up from Batsi Bay with views of the indented coastline and a Greek warship moored in the middle of the bay. The views opened up across a blue sea to distant Islands as the road climbed to 700ft. We stopped in the small village of Paleopoli for elevenses and then continued climbing to the high point of 920 feet. 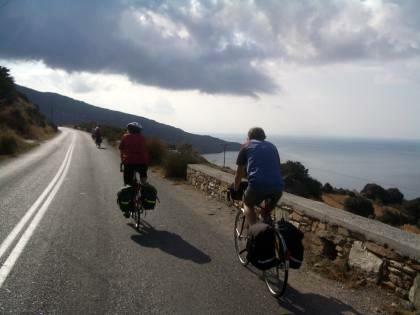 Then a long descent to Andros Town and our hotel on the beach. 16 miles for the day and 1141ft of climbing . Thursday 28 September. Tinos to Andros. Today we were moving on from Tinos Island to Andros the next Island north. Weather started wet but soon cleared with temperatures up to 24C. We caught the 10.15 ferry for a 90 minute crossing sailing north along Tinos Island with views of roads we had cycled a few days before. 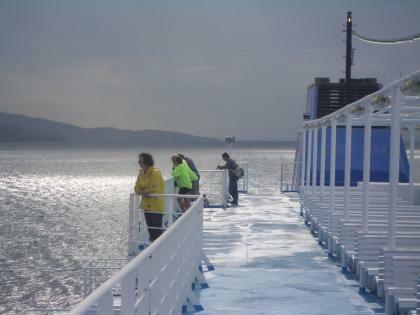 The ferry was luxurious by Greek standards with an escalator up to the Decks. We sailed into Gavio Port towards the north of Andros Island. We stopped for lunch at the port and then a short ride south to the resort of Batsi. In the evening we enjoyed a meal with a great view of the sunset across the harbour. 5.5 miles for the day and 300ft of climbing. Wednesday 27 September. 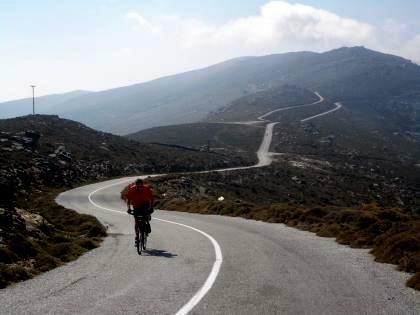 Tinos, Ride to the North Coast. Today was a nominal rest day without any moving on so I planned a ride over the 1000ft central Ridge, down the other side to a North Coast beach and then back over the Mountain to Tinos Town. Everybody, somewhat surprisingly went along with the idea except Ernie and Nicola who decided to have a rest and do some snorkelling. Weather was very good with clear blue skies and temperatures up to 27C. We rode up via many hairpin bends and past the great rocky crag of Exobourgo which we scaled earlier in the week. Then a fast steep downhill to the North Coast and the beautiful sandy bays at Kolymbithra. We stopped for elevenses at the beach Taverna and then down to the near empty sandy Cove for several swims and a picnic lunch. 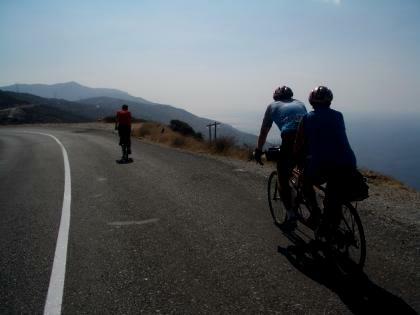 Then back up the hill to 1000ft and a fast downhill back to Tinos Town. 22 miles for the day and 2165ft of climbing . Tuesday 26 September. Paranormos to Tinos Town. Today we headed back to Tinos Town. Weather was mainly dry with a couple of short showers and feeling warm and humid with light winds. We started with a climb back up to Pyrgos and looked round the narrow alleys of the town. Then onwards and upwards with many hairpins to the 1100ft pass. We stopped at a Church with a view down to the sea from 1000ft for a picnic lunch. Then on and mainly down retracing our outward route to the seaside resort of Kiona for a Taverna Tea stop. Then back to Tinos to a prebooked beachside Hotel and a late afternoon visit to the Hotels Pool. 17 miles for the day and 1587ft of climbing. Greece. 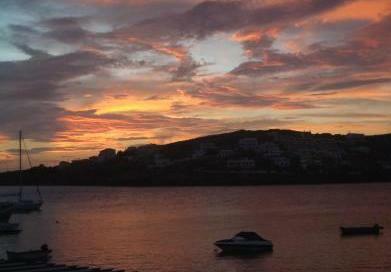 Sun 24th Sept and Mon 25 Sept. Tinos Island. Today was an out and back ride to explore the mountain roads to the north of Tinos Town. Rain again came through conveniently overnight clearing by breakfast. The rest of the day was sunny and warm up to 24C. 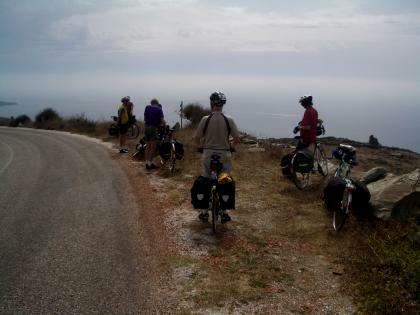 We had a long winding climb from Tinos Town with the countryside getting more remote with terraced hillsides falling over a 1000ft to the great seascape below us dotted with Islands. Our destination was the great rocky peak of Exobourgo topped with a Venetian Fortress. From the south side it looked unreachable with anything other than Crampons. We did a great circle round it with one steep climb reaching 23%. The last bit of road was up to a church from which it was a 10 minute walk to the top on a track. 20 miles for the day and 2227ft of climbing. Monday 25 September Tinos to Paranormou. Weather today was sunny with some cloud hanging over the mountains. We moved on from Tinos Town to the far NW of the Island. We headed west along the coast to Kionia and then a long climb to a ridge and a break at a Church under the shadow of a wind turbine. We continued on the road heading NW at about 900ft with great views down to the coast. After a few hairpins the high point of 1100ft was reached above Ysternia. Then downhill to the pretty village of Pyrgos where we stopped for lunch in a Taverna. Then down to the bay of Panormos where we checked into Rooms for the night. Late afternoon was spent at the empty beach with a swim. 17.5 miles for the day and 1630ft of climbing .